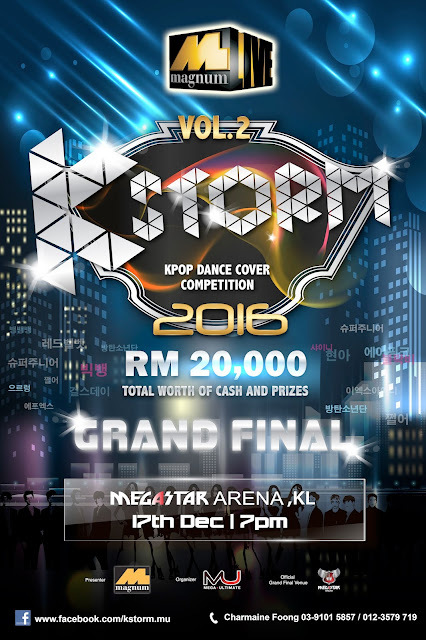 After a year, the most anticipating K'Storm Vol.2 Dance Cover Competition 2016 finally returns with a larger scale and a grand prize worth up to RM20,000 for the winners. State Winner will be selected in each state and will walk away with RM500 cash prize. Top 3 performances from each state will be selected and enter the Grand Finals which will be happening on 17th December 2016! 15 groups in total will be eligible to compete in the Grand Finals and only 1 group will be crowned as the Champion of K-Storm VOL.2 Dance Cover Competition 2016. The highlight of this year competition would be the workshop. The organiser will be conducting a workshop for the grand finalists to experience the trainees' life just like the Koreans trainees. Preliminary stage will be starting from Johor state from 8th October onwards, followed by Klang Valley, Penang and Malacca. K'Storm Vol.2 Dance Cover Competition 2016 is proudly brought to you by Magnum and organized by Mega Ultimate. Venue Sponsor: JB City Square, Sungei Wang Plaza, Megamall Pinang, Mahkota Parade and Klang Parada. Official Grand Final Venue: Mega Star Arena. For more information kindly contact Charmaine Foong at 03-9107-7223. You may also log on to www.facebook.com/kstorm.mu,www.megaultimate.com.my or www.facebook.com/megaultimate for more details on the event.